This epic week started like all the others. We showed up to the field, we reffed, and we drank some drink. It would have been nice if the beer was on time ... Nick... This was no normal night though, this was "Party Animal" night. HMBAWT was adorned in more animal print than the summation of all 80's hair bands combined. It was a beautiful thing! We were also ready (even though we didn't know it) to unleash our inner tiger (or bear) all over Tyler's Team of Degenerates (TTD). They started by scoring 4 runs right away, with which HMBAWT answered with 5. HMBAWT then proceeded to get up (we have problems with this at times) even more, with 3 more. TTD roared back, but could not rise to the occasion and conquer HMBAWT. The game was reffed by Vodka Red Balls (VRB) and HMBAWT would like to say that they were the most thorough refs we have ever had. VRB brought binders full of refs to the field (one at each base) and they definitely went together well with our "flash drives" full of animal print and "floppy disks" (Ha, it sounds like ... nevermind...) full of animal masks. Celebrating ensued upon victory, provocative photos were taken (you know you liked it Michelle), and Mariah shared with the team "things she can do with her underwear" (she didn't want this to be quoted, but we want her to embrace her skills)! At the bar excitement levels stayed high, so high in fact that Michelle "peed a little", but this didn't get the team down. We continued on to win at the bar as well ... this was definitely NOT a YOLO (You Only Lose Once) week. 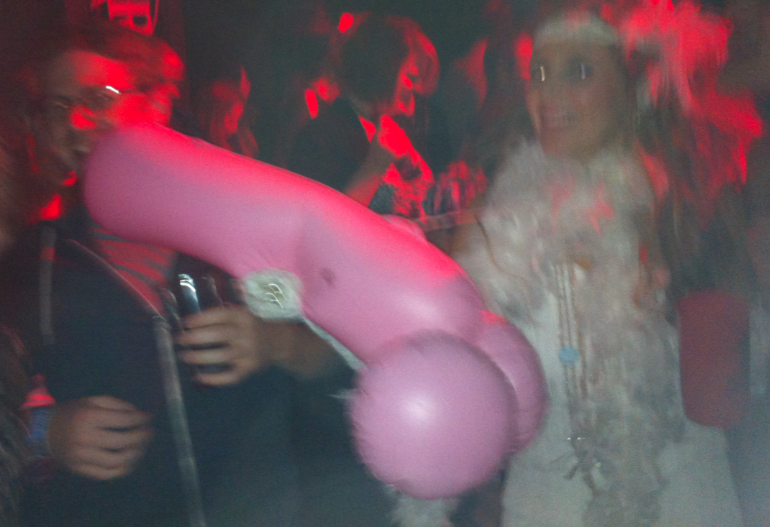 This enthusiasm continued into the weekend as well and climaxed at the mid-year party. Food was consumed, muffins were munched, booze was drank and dancing was done. 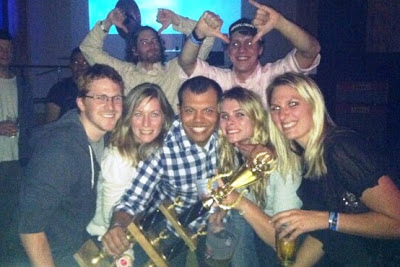 One of the HMBAWT flip cup teams won the tournament, again, for the third time in a row (can you say dynasty?). Besides completing the "Win Trifecta" for the week HMBAWT loved the wings that were being whored around the dance floor and HMBAWT'er Ginger Joe even got a little something extra to end the week. Please excuse us while HMBAWT continues to recover from our #Winning hangover.